dangerous underwater world full of corals and sharks. Avoid hitting coral. speed, and level of energy. - Simple one touch control gameplay. 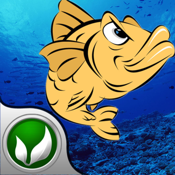 Tap & Release your fish to controle the fish. - Tilt your iPhone to right to speed up!